METISfiles analyst Pim Bilderbeek was the keynote speaker at the Innovation Group’s Mobile Summit in Milan this week. His presentation focused on the mobile economy that has emerged as a key engine of economic transformation. The figure below provides a graphical representation of four major themes that were addressed. Mobile is a game changer for customer experience. An example of this can be found in the changing communication behaviour of connected consumers. Unlike legacy communications where fixed telephony provided good voice quality and the ability to communicate privately, the new consumer communications experience is about the convenience of using multiple communications modes to share experiences with others. Mobility infiltrates the enterprise. Consumer buying behaviour is shifting, and the customer buying experience is becoming increasingly important. There is a whole new consumer and enterprise ecosystem out there. CIO’s no longer control what comes in and what goes out and are increasingly pushed by employees’ BYOD and BYOapp into the enterprise. Business models break out of silos. Traditional value chains are rapidly being unbundled. Telephony (e.g. Skype), mobile (e.g. MVNO), TV (e.g. YouTube) and Internet access (e.g. unbundled local loop or unlicensed Wi-Fi) are all available as standalone products or services and are becoming features of other apps or functions in the browser. The gang of four trigger the mobile economy. 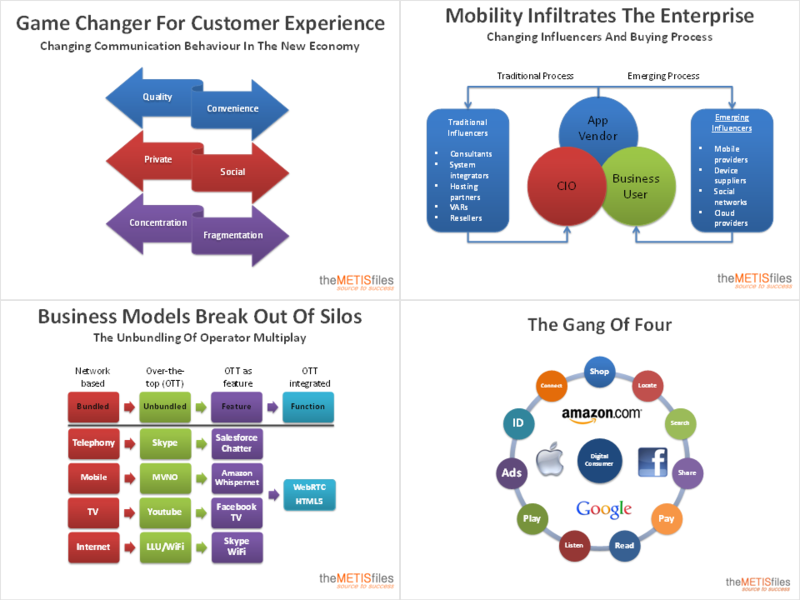 Today’s mobile ecosystem leaders include Amazon, Apple, Google and Facebook, also known as the “Gang of Four”. They have built their ecosystem leadership roles in retail, devices, search, and social networking. They all go for a superior and stickier user experience by creating an engagement model that combines content, device and personalization in order to create a larger and long term share of the consumer wallet. They all want to become the primary engagement vehicle for the connected consumer. From placing a premium on business model reinvention to understanding the full impact of mobility in the workplace to developing a laser focus on improving the customer experience, companies across all sectors of the new mobile economy must embrace fresh ways of thinking about how they do business today to become the mobile leaders of tomorrow. Would you like to have a METISfiles analyst set the scene for your internal or external event? Contact us to find out how we can help. Personal Cloud: Is It Safe?